Posted on Wed, Mar 21, 2012 : 1:05 p.m.
Ann Arbor Center for Independent Living has released security camera footage showing the recent theft of a trailer containing sports equipment for the disabled. Robert Schnitzer, a software team leader at Pixel-Velocity, and Carolyn Grawi, an official at AACIL, both emailed AnnArbor.com with seven videos showing a vehicle entering the center’s parking lot before leaving with the trailer in tow. Officials from the center and Ann Arbor police investigators are hoping the items will be returned, but so far there hasn’t been much good news. Ann Arbor police Lt. Renee Bush said this week there isn't anything new to report in the case, but the investigation is continuing. 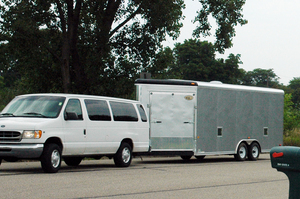 The trailer was stolen at about 11:23 p.m. March 11 from the center’s parking lot at 3941 Research Park Drive. Officials from the center have estimated the theft will cost about $30,000 between the value of the trailer, the handcycles, tricycles and other items inside. The video shows a full-size SUV, such as a Ford Expedition or a Chevrolet Suburban, speeding into the parking lot before heading back out with the trailer. Security cameras from Pixel-Velocity, a company located next to the AACIL, were able to capture the images. The theft has thrown the spring exercise programs put on by the center into jeopardy, Grawi said. To view all of the videos of the theft, click here. Thu, Mar 22, 2012 : 3:15 p.m. I would look into a &quot;coupler lock&quot; so this does not happen again. Hey, Folks, there are several fund raising efforts going on at the moment to help A2CIL recover from this theft! Please consider helping out. One is sponsored by the Japanese Martial Arts Center, which you can contact at info@japanesemartialartscenter.com, and the other is sponsored by the Southside Business Association. Their email is southsideannarbor@gmail.com. Thank You! Thu, Mar 22, 2012 : 2:54 a.m. Does this mean that this was an uninsured situation? Wed, Mar 21, 2012 : 9:25 p.m. Wed, Mar 21, 2012 : 10:05 p.m. The real answer is that you can volunteer to download the footage, edit and resubmit it. Wed, Mar 21, 2012 : 6:30 p.m. Wed, Mar 21, 2012 : 9:22 p.m.
Not really most truck have a plug in the rear bumper that allows almost any trailer to be plugged in so all the lights will work with the vehicle. Wed, Mar 21, 2012 : 5:23 p.m. So, why is the picture on the main page one of a large Econo-van pulling a trailer when the video obviously shows an SUV type vehicle? Wed, Mar 21, 2012 : 5:31 p.m.
We just added the photo caption to clarify that the picture is a closer view of the trailer as it was used by the center. They provided us with the photo. Wed, Mar 21, 2012 : 5:27 p.m. The caption for the picture says &quot;Photo courtesy of Ann Arbor Center for Independent Living&quot;, so I'm assuming it's to show what the trailer actually looks like. Wed, Mar 21, 2012 : 5:18 p.m. The $64.00 question is did the facility have insurance to cover this type of theft? Wed, Mar 21, 2012 : 5:16 p.m. Wed, Mar 21, 2012 : 5:21 p.m.
As long as there's a market for such items, there will be those who will steal to meet the demand. But a sad commentary on the ethics and morals of some who would steal and victimize the disabled.